An arthroscopic meniscectomy is a procedure to remove some or all of a meniscus from the tibio-femoral joint of the knee using arthroscopic (keyhole) surgery. The procedure can be a complete meniscectomy where the meniscus and the meniscal rim is removed or partial where only a section of the meniscus is removed. This may vary from a minor trimming of a frayed edge to anything short of removing the rim. This is a minimally invasive procedure often carried out as an outpatient in a one-day clinic and is performed when a meniscal tear is too large to be corrected by a surgical repair of the meniscus. Where non-operative therapy provides some degree of symptom relief over the long-term, these benefits may become increasingly ineffective as the affected meniscus degenerates over time. In such cases, partial arthroscopic meniscectomy can be more effective in improving patient quality of life. Majewski reports that injuries to the menisci are the second most common injury to the knee, with an incidence of 12% to 14% and a prevalence of 61 cases per 100,000 persons . Football and rugby, followed by skiing, are the sports with an increased risk of acute meniscal injuries. Amongst injuries affecting the knee, he suggests that most involve the anterior cruciate ligament (ACL), the medial and lateral meniscus. He also observed that 85% of patients with meniscal and ACL injuries require arthroscopic treatment . For degenerative meniscal tears, there is strong evidence that age (greater than 60 years), gender (male), work-related kneeling and squatting and consistently climbing stairs of greater than 30 flights are risk factors for meniscal tears. There was also strong evidence that sitting for longer than 2 hours per day may reduce the risk of degenerative meniscal tears . Barbara et al suggest that waiting more than 12 months between ACL injury and reconstructive surgery is a risk factor for developing a tear of the medial meniscus  . Joint line tenderness may present a false positive as other diagnosis' may be; osteoarthritis, osteochondral defects, collateral ligament injury or fractures. Effusion may also occur when there are problems with the cruciate ligaments, bones or the articular cartilage. Pathologies such as chondromalacia patellae, fractures and Sinding Larsen Johansson Syndrome can share the same symptoms of increased pain on knee flexion, loading the knee, squatting and kneeling. 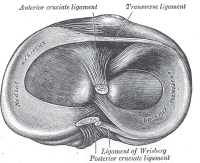 A sensation of giving way is not unique to meniscal damage, but also in patients an anterior cruciate ligament injury. The feeling of instability and locking is also common with osteochondritis dessecans. McMurray's test is positive if an audible pop or a snap is heard at the joint line whilst flexing and rotating the patient's knee. Appley's test is performed with the patient prone, then hyper-flexing the knee and rotating the tibial plateau on the femoral condyles. Steinman's test is performed on a supine patient by bringing the knee into flexion and rotation. Ege's Test is performed with the patient squatting. A positive result is an audible and palpable click heard/felt over the area of the meniscus tear. The patient's feet are turned outwards to detect a medial meniscus tear, and turned inwards to detect a lateral meniscus tear. Small, degenerative meniscal tears are often treated conservatively with rest, NSAIDS, reducing load bearing on the joint through activity modification and treating with physical therapy. Where a non-surgical approach is taken it is essential that a good level of strength is achieved and maintained in the affected leg and activities requiring pivoting or sudden changes of direction are avoided. If the tear is large, in a low vascularised region or if conservative management fails to alleviate the associated pain and joint dysfunction then surgery is the next step . 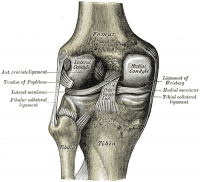 Two small incisions are made in the anterior region of the knee below the patella. A camera is inserted through one of the incisions so that the surgeon can see the inside of the knee joint on a monitor. The other incision is used to place a tool into the joint that will clip and remove the torn piece of cartilage. While the camera is inside the joint the surgeon uses this opportunity to examine the rest of the knee to make sure it is otherwise healthy. After meniscectomy rehabilitation protocol can be aggressive, because the knee joint anatomical structures should not be overly protected during the healing phase. The rehabilitative treatment consists of ice-ultrasound therapy, friction massage, joint mobilisation, calf raises, steps-ups, extensor exercise and cycling. (LOE 5) Treatment under water cannot begin until the wounds have properly closed in order to prevent increased risk of infection. In the first week after surgery rehabilitation treatment consists of a progressive loading with crutches. Early objectives after surgery are: control of pain and swelling, maximum knee range of motion (ROM) and a full weight bearing walking. There is no load limitation, with weight bearing being as tolerated by the patient. In the subsequent 3 weeks the goal is to normalise gait and to increase knee ROM, led by the patient’s tolerance. Intensive muscle strengthening, proprioceptive and balance exercises are carried out around the third week. Return to sport/activities is recommended only when the quadriceps’ muscle strength is at least 80% of the contralateral limb. Competitive level sport is, however, not recommended until muscle strength in the affected limb is at least 90%. Goals are to decrease inflammation, restore the range of motion and the neuromuscular re-education of the quadriceps. Recommended exercises in the first phase are: long arc quadricep, short arc quadricep, hamstring curls (open chain exercises), cycling and leg presses (Closed chain exercises). Goals are to restore muscle strength and endurance, to re-establish full and pain free ROM, a gradual return to functional activities and to minimise normal gait deviations. More concentric/eccentric exercises for the hip and the knee should be added to the open chain exercises from phase 1. Closed chain exercises in phase 2 could be resisted terminal knee extension, partial squats (not complete), step up/down progressions, toe raises, functional and agility training. The goals of the final phase are to enhance muscle strength and endurance, maintain full ROM and a return to sports or full functional activities. This phase is based on progression to dynamic single leg stance, plyometrics, running, and sport specific training. Restore range of motion using exercises within the limits specified by the surgeon  (LOE 4) If a meniscal repair has been performed, extreme flexion and rotation should be limited until the wound in the meniscus has healed (8 to 12 weeks). Restore muscle function using targeted strengthening exercises for the quadriceps, hamstrings, hip. Examples:  (LOE 4, LOE 3A) Strengthening around the knee is crucial, but it is also necessary to re-establish proximal stability and strength if weight-bearing was restricted pre- or post-operatively. Raine Sivhonen et al., ‘a protocol for a randomised, placebo surgery controlled trial on the efficacy of arthroscopic partial meniscectomy for patients with degenerative meniscus injury with a novel ‘RCT within-a-cohort’ study design.’, CMAJ, 2014 Oct 7; 186(14): 1057–1064. Brindle T, Nyland J, Johnson DL. The meniscus: review of basic principles with application to surgery and rehabilitation. J Athl Train. 2001;36(2):160-169. ↑ 1.0 1.1 1.2 1.3 McKeon B, Bono J, Richmond J, editors. Knee arthroscopy. London:Springer, 2009. ↑ 2.0 2.1 2.2 2.3 Atkinson HDE, Laver JM, Sharp E. Physiotherapy and rehabilitation following soft tissue surgery of the knee. Orthop Trauma. 2010;24(2):129-138. ↑ Hede A, Jensen DB, Blyme P, Sonne-Holm S. Epidemiology of meniscal lesions in the knee. 1,215 open operations in Copenhagen 1982-84. Acta Orthop Scand. 1990. ↑ Majewski M, Habelt S, Klaus Steinbruck. Epidemiology of athletic knee injuries: A 10-year study. Knee. 2006;13(3):184–188. ↑ Church S, Keating J, Reconstruction of the anterior cruciate ligament: timing of surgery and the incidence of meniscal tears and degenerative change, J Bone Joint Surg Br. 2005 Dec; 87(12): 1639–1642. ↑ Meserve BB, Cleland JA, Boucher TR. A meta-analysis examining clinical test utilities for assessing meniscal injury. Clin Rehabil.2008;22:143-161. 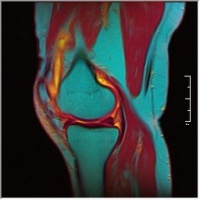 ↑ 12.0 12.1 12.2 12.3 12.4 12.5 12.6 12.7 12.8 12.9 Teller P, Konig H, Weber U, Hertel P. MRI atlas of orthopedics and traumatology of the knee. London:Springer, 2003. ↑ Cannon WD, Jr., Vittori JM. The incidence of healing in arthroscopic meniscal repairs in anterior cruciate ligament-reconstructed knees versus stable knees. Am J Sports Med 1992; 20 (2) 176-181. ↑ MESSNER K, GAO J. 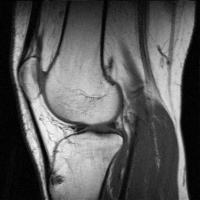 The menisci of the knee joint. Anatomical and functional characteristics, and a rationale for clinical treatment. Journal of Anatomy. 1998;193(Pt 2):161-178. ↑ 27.0 27.1 Frizziero A, Ferrari R, Giannotti E, Ferroni C, Poli P, Masiero S. The meniscus tear: state of the art of rehabilitation protocols related to surgical procedures. Muscles, Ligaments and Tendons Journal. 2012;2(4):295-301. ↑ 28.0 28.1 Thomson LC, Handoll HH, Cunningham A, Shaw PC. Physiotherapist-led programmes and interventions for rehabilitation of anterior cruciate ligament, medial collateral ligament and meniscal injuries of the knee in adults. Cochrane Database Syst Rev. 2002;(2):CD001354.